Christ Church is seeking experienced and professional individuals who wish to use their time and talents to shape lives through Christ and promote the vision and mission of the church. Applicants must have a College Degree and three years of experience with program development. Resumes must be submitted by January 31, 2019 to hopefully fill the position in January or February. 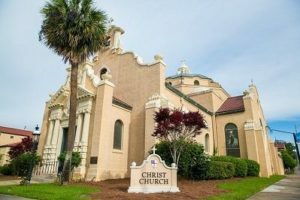 Christ Church Parish is a growing Episcopal church in downtown Pensacola with an average Sunday attendance of 400. The church is filled with a variety of people who are welcoming, caring, Christ-centered and generous. A vital part of the ministry of Christ Church is the Episcopal Day School with 385 students PreK2 to 8thgrade. Christ Church Parish is committed to creating a welcoming and supportive environment for all youth; the Director of Youth Ministry will be expected to engage with and support students of all backgrounds and orientations. The Director of Youth Ministry will be responsible for casting a vision for ministry for and with the youth of Christ Church Parish and then implementing that vision. The Director of Youth Ministry will develop and oversee a team of people to engage the youth of our community with the Gospel of Jesus Christ. Demonstrate the ability to work with an established volunteer team to design, develop, and implement a vibrant, comprehensive, growing and sustainable ministry. Have an entrepreneurial spirit and a desire to engage youth in outreach (serving others in Jesus’ name). Have a strong track record in ministry, preferably with youth. Thrive in working as part of a team (church staff, established youth volunteers, larger church community, etc. ), yet also be self-motivated with strong leadership abilities. Pray for the youth by name. Cast a vision for youth ministry at Christ Church. Recruit, train, and support a team of youth leaders. Maintain a calendar of youth activities including programming, fellowship, and outreach. Effectively communicate with youth and parents. Organize Christian Education on Sunday morning (Sunday School). Attend weekly staff meetings (Tuesday mornings) and regular Sunday services. Engage with the Episcopal Day School to build relationships with students. In particular, occasionally teach Christian Ed and lead chapel services. This position is not responsible for these activities but will be involved.